If you nod, we have exactly what you are looking for! It is a sturdy, durable, LONG-LASTING surge protecting power bar, ETL Certified and absolutely reliable for your needs. 1. Please check the power of electric appliance before using socket. 2. Do not touch the socket when the hand is wet. 3. Avoid the place where children could touch. 4. Do not partly twine the wire to avoid fire. 5. Do not use the socket in wet environment. 6. Do not disassemble by yourself. Multi-function Wall Tap - Charge ALL your electronic devices with high-end ON wall tap surge protector plug with 6 power outlets + 2 USB ports! Perfect for keeping tablets, smart phones, and other rechargeable electronics ready to use. Get rid of the clutter of multiple wires. Swivel Sockets Design - Smartly designed with 3 fixed side-way sockets and 3 swivel sockets, this electric surge protector is made to make your life easier! 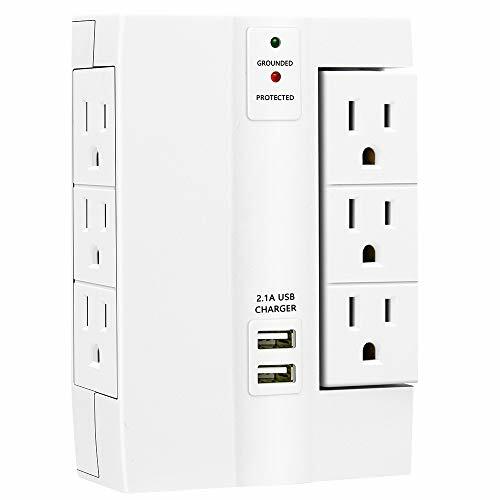 3 Swiveling outlets can rotate 90°, allows for convenient angles to plug in equipment, perfect for providing power protection and distribution from outlets located in tight spaces, such as behind a bookcase or desk. Surge Protection - Don't leave your devices to the mercy of voltage fluctuations, unstable networks or energy spikes. Protect them against lightning and other surge factors with our wall mount surge protector for Live, Neutral & Earth wires, the best PC, TV, refrigerator and mobile surge protector on the market! Durable & Portable - Sturdy Case, Constructed of impact-resistant material for maximum durability. Light and handy, easy to carry during the traveling. Simple and secure installation into any vertical grounded AC outlet with the integrated stabilizing post. This surge protector power strip will also follow on your travels! Take it with you on your business travels, holidays or weekend trips and enjoy fast. Security - ETL Certified (Conforms to UL STD.NO.1363 and UL STD.NO.1449, Certified to CAN/CSA STD.C22.2 No. 21). Green LED "Protected" and "Grounded" indicators alert you of the current power status and ongoing surge protection. We Promise 12 months Warranty. We will provide Consistent Quality Timely Service for Every Customer. If any questions, please contact us, we will try our best to help you. If you have any questions about this product by LOVIN PRODUCT, contact us by completing and submitting the form below. If you are looking for a specif part number, please include it with your message.